We all know that fruits are picked when they are unripe so that they are less damaged in transport to market and they can be "fresh" when they arrive ie not rotten. I have just discovered that this is only true for some fruits. Fruits that ripen post harvest are call climacteric. And unsurprisingly fruit that does not ripen are called non-climacteric. Climacteric fruits that ripen post harvest like bananas and tomatoes release ethylene thus ripening. Ethylene is a plant hormone and is made inside plants. And yes this is the same gas that is used in some welding, and it is the same as the ethylene used as a anesthetic. Th e no-climacteric fruit includes citrus, grapes, litchi's and strawberries. This explains to me why strawberries purchased from shops always taste sour compared to home grown ones. It is the final ripening process that release sugars. Thus strawberries picked before they are 100% lock in their sugar levels at a lower level. This may also explain why I don't like the taste of imported citrus. It always tastes funny, although this could be due to the difference growing conditions in California than NZ! Interesting enough the non-climacteric fruits do have ethylene receptors that are active. 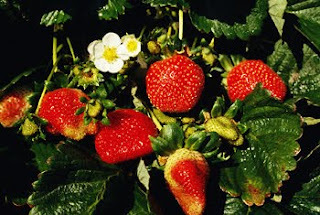 So in theory you could store strawberries with a climacteric fruit such as banana's and the strawberries might ripen. I will try this when strawberry season comes around again.